The Conversation Project - Dinner Hosts Wanted! 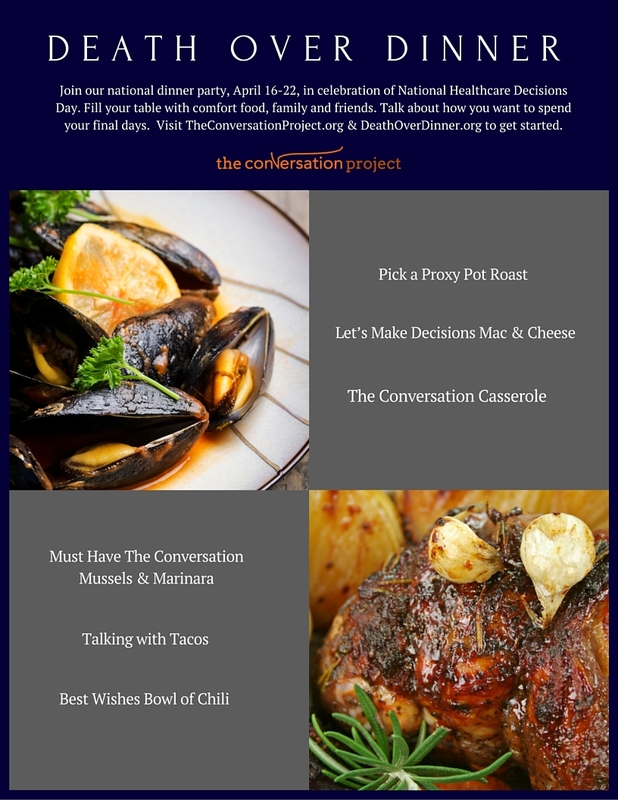 The Conversation Project | Dinner Hosts Wanted! 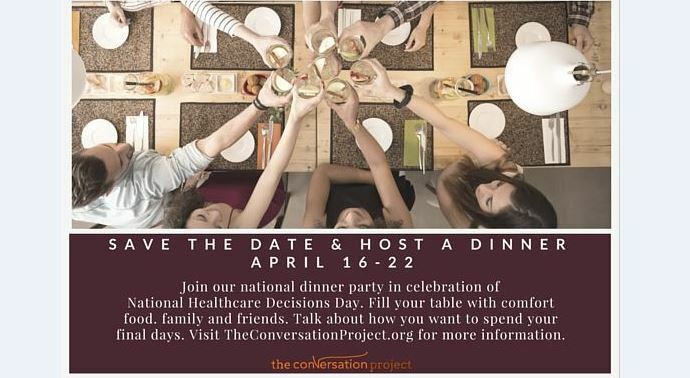 In celebration of National Health Care Decisions Day, The Conversation Project and Death Over Dinner are teaming up once again to challenge Americans to fill their table with comfort food, family, and friends – to break bread and taboos by taking part in a nationwide dinner party. April 16 marks National Healthcare Decisions Day, a day designed to educate and empower the public to make decisions about their wishes for end-of-life care. After we file away our taxes with the IRS, we also need to organize and file away how we want to spend our final days. Joining is easy: Pick a date during the week of April 16-22, 2016, send an invite to loved ones, and then set the table to start talking about end-of-life care and how we want to live the final days of our lives. We’ll provide the tools and tips to get the conversation started. You choose the guests and the menu, and let the conversation and the wine flow. Pile high your favorite sandwiches for a “Death Over Deli” style picnic – pass the pickles while you pick proxies. Is your family full of sweet tooths? 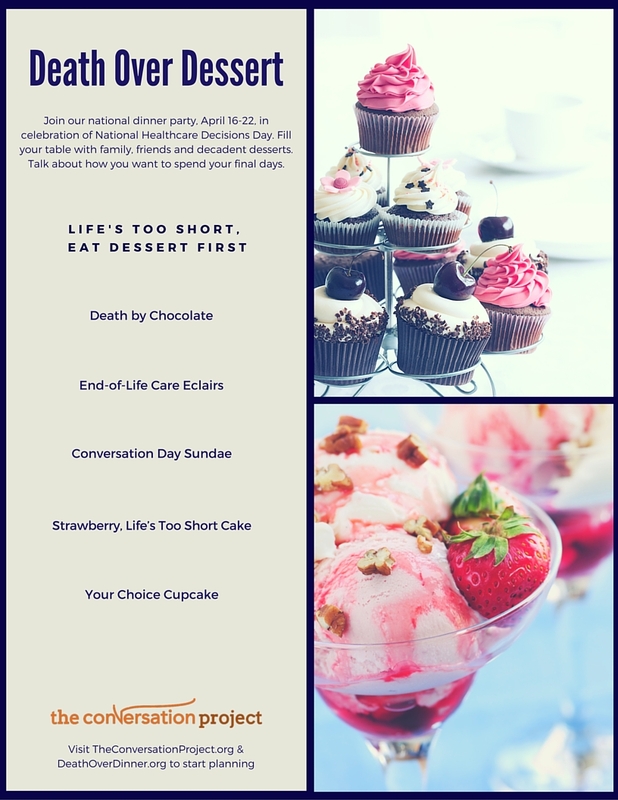 Skip dinner and go straight for dessert with a decadent “Death Over Dessert” celebration. Toast to life and loved one’s lost with a “Death Over Drinks” party. Shake up a sampling of crowd favorites and drink in an intimate conversation about how you want to spend your final days. Make it a potluck “Death Over Dinner” event and ask each family member to bring a dish that’s meaningful and comforting. You can kick off the night by asking each guest to share the story behind their dish. 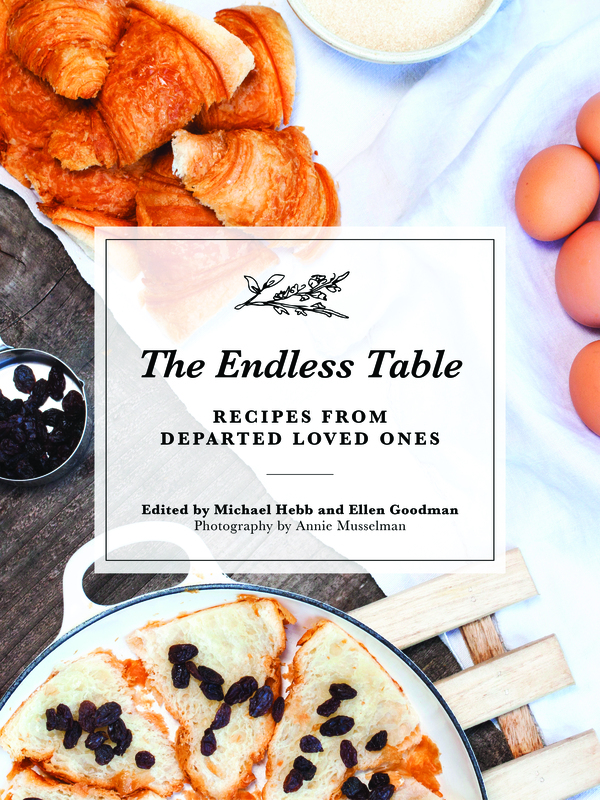 To whet the appetite for this conversation, the groups also offer a delicious side dish: an e-cookbook, “The Endless Table,” recipes from departed loved ones, available for download for $8.99. Famous foodies like Tom Colicchio, Ina Garten, Ben Ford, Jasper White, Jody Adams, José Andrés, Roger Berkowitz, Michel Nischan and many more have donated a recipe in honor of a loved one, along with a personal story about why the dish they chose is personally meaningful. Proceeds of the e-cookbook will benefit both public engagement campaigns, The Conversation Project and Death Over Dinner. This is the third consecutive national dinner party hosted by the nonprofits. The past two years garnered more than 3,000 dinners held throughout the U.S. during the campaign and drove more than 40,000 people to the organizations’ websites for more information and to download The Conversation Project’s Starter Kit. Ninety percent of Americans say it’s important to talk about their end-of-life care wishes, yet 30 percent of people actually have that conversation. 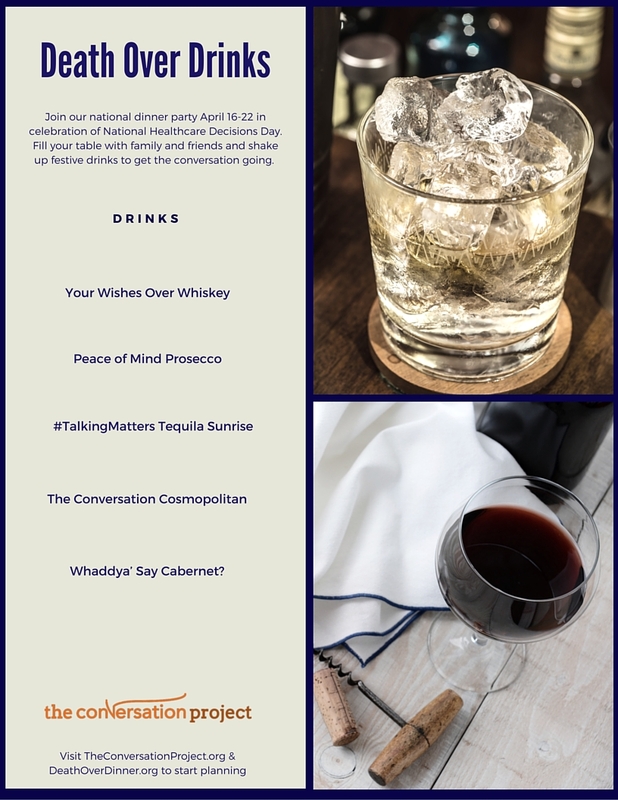 The goal of this weeklong dinner party is to change the nation’s culture from not talking about end-of-life care to talking about it – in thousands of kitchens, living rooms, coffee shops and restaurants across the country. 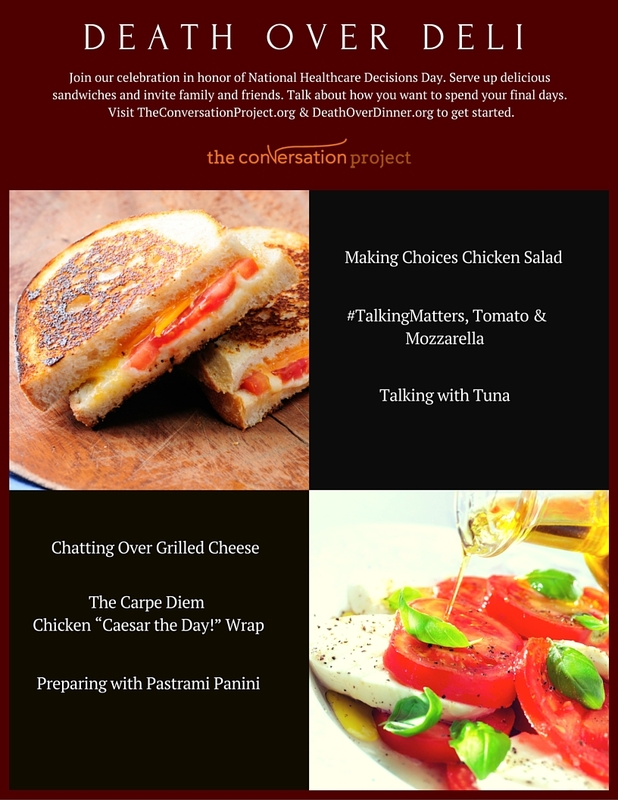 For more information, or to register for a dinner, visit theconversationproject.org and deathoverdinner.org. I am a women’s health nurse practitioner (recently retired!). I founded a 501c-3 organization called, The Women’s Information Network, Inc. in 1992. The mission statement: To educate and empower women through information and interaction. We are planning a workshop to address end of life issues on September 24, 2016. I love your site. You have given me some ideas for follow up to generate conversations. I want to empower individuals in our community to not only talk about their own wishes, but to learn what to expect from the dying person, what to say—or NOT say, how to interpret their symbolic talk, etc. Any ideas or marketing ideas would be greatly appreciated. As I’m sure you know, it is a rather difficult topic to get our current society to understand because they are so far removed from the dying process.